Cover art by Vincent Sammy. 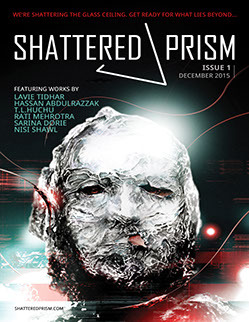 The first issue of Rosarium Publishing’s new prozine Shattered Prism is out. The contents can be read online, or an ecopy can be purchased for download ($2.99). Editors Carmelo Rafala and Amir Naaman set the magazine’s agenda in “The Human Sea”. This is our humble addition to the fight: stories of the imagination that know that realism—indeed, reality itself—is a construct. And it is how we construct reality through our own personal prisms of experience that the world around us takes shape. A personal experience. But this gives readers a great opportunity. Stories of the imagination asks us—indeed, demands of us—to step back and view another’s reality. It is in this viewing that we begin to recognize that there can be common understanding of the varied and beautiful people in this earthly kaleidoscope we call the Human Sea. And these short stories give us the perfect opportunity to do just that. Stories that shatter the prism of light, showing us new shapes and colors. Often popular culture makes it possible for those of us formerly excluded from it to count ourselves in. Ads admit that people of color shampoo their hair; anthologies invite immigrants to submit their stories; websites offer those signing up for their services dozens of genders by which to identify themselves. Yes, a backlash has risen against this trend of accommodating diversity; some find it threatening. Yet both the coherency and multiplicity of the voices with which we air our beautiful differences, proudly proclaiming our variant glories, the focus and ambience of our cries for the freedom of the world to be comfortable with its complex self–these qualities bode well for our prevailing. Especially when it comes to the kind of futures we dare to dream up…. This entry was posted in Like Show Business and tagged Amir Naaman, Carmelo Rafala, Nisi Shawl, Rosarium Publishing, Shattered Prism by Mike Glyer. Bookmark the permalink.